Top News Memes Of 2011: Pepper Spray Cop, Bin Laden, Steve Jobs : The Two-Way All three started as one thing and became something else entirely as people used digital tools to add their own interpretations and comments and then spread their work around the Web. Spraying the Declaration of Independence (John Trumbull's "Declaration of Independence"). Also in the group: a photo of President Obama and his top advisers awaiting word of Osama bin Laden's death and the news that Apple Inc. co-founder Steve Jobs had died. They fit perfectly into the somewhat loose definition of a meme. All three started as one thing — in the case of "pepper spray cop" it was video of a University of California, Davis, officer casually walking down a line of seated protesters as he shot the stinging spray into their faces — and became something else entirely as people used digital tools to add their own interpretations and comments. 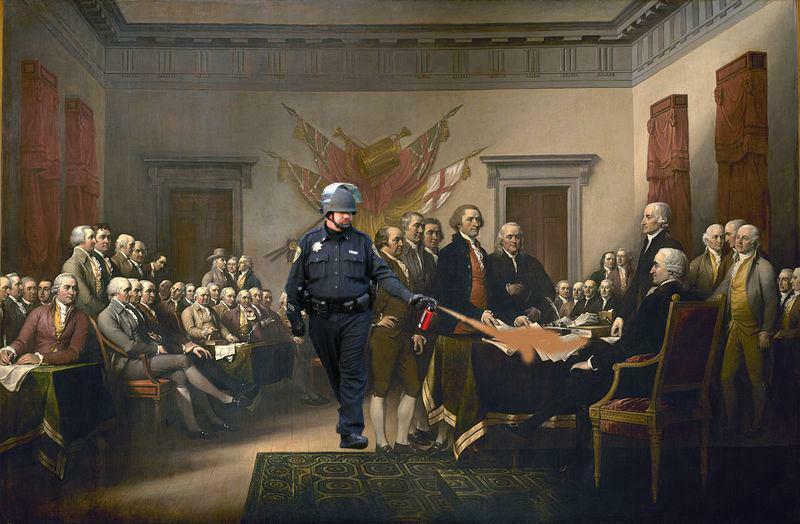 The officer's image was digitally transferred into works of art to make political statements (in one, he was spraying the Declaration of Independence). Obama and his advisers were joined in the Situation Room by superheroes, cats and the little girl who looked so grumpy on the balcony of Buckingham Palace. Jobs was both memorialized and criticized by people around the world. Memes "show us a lot about what's going on in culture, what's going on with the zeitgeist" and in the news, says Know Your Meme senior reporter Don Caldwell. And though there's no way to precisely calculate the relative strength of memes, when they looked at the number of YouTube videos, webpage views and other indicators, Caldwell says, Know Your Meme's staff concluded the top 3 had to be the officer, the Obama team and Jobs. They've announced their "findings" this morning. Putting the UC Davis police officer into different situations was sometimes humorous, Caldwell says, "but people weren't making fun of it as much as ... trying to spread it around that it happened." On Jobs, a lot of what was done was meant "to give respect [to him] as somebody who inspired them." The Situation Room scene was simply "huge ... it was remixed and photoshopped" countless times. Of course, memes don't have to be about serious stuff. Caldwell says that among the most memed subjects in 2011 were cartoons — My Little Pony, '60s Spider-Man and Nyan Cat were particularly popular subjects. And then there's the "Nope, Chuck Testa" meme that took what may be one of the funniest set of TV commercials about taxidermy ever and made them Web stars. And who could forget Rebecca Black's Friday, planking or some of the other memorable memes of the year? Know Your Meme has a video report on its findings here. The range of memes definitely shows "what the Internet has to offer ... a lot of different types of things from the very serious to the very weird and bizarre," Caldwell says. Also this week, Facebook looked at the top memes of 2011 among its members. No. 1: bin Laden's death. No. 2: the Green Bay Packers' Super Bowl win. No. 3: Casey Anthony being found not guilty.